Welcome newbies! Whether you're new to sugar gliders or just new to our board come introduce yourself! You'll make tons of friends in no time! This is a place for the mods and admins to tell the members about new rules, a problem or an announcement that has to do with the board. If you have an emergency and need help please post here! (Remember we are not vets). Where to find information about past emergencies that had a happy ending. Emergencies that ended tragically will be moved to the "Rainbow Bridge" area. 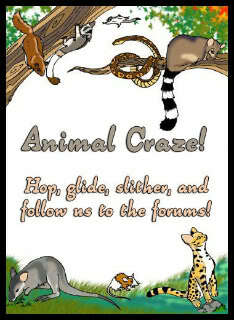 A place to meet other animal people! Chat, have fun and most of all keep it clean! Got a problem and need to vent? Well this is the section you need!! Have Debates here. Please keep them clean and under control. Remember we are a family board. Teens Need to talk? Come here and talk about everyday life and just problems! Everyone is here for you!! Post raffles and requests for donations here. Please contact a mod or admin for approval before posting! For those of you with valid Organizations... Must obtain permission through Laci to start an initial post here!! This is a forum to discuss the oh so cute fennec foxes! From diet to housing and fun stories about your fennecs! This is the place for everything fennec related! This is the place to discuss the procyonidae or raccoon family. Which in the pet trade include but are not limited to kinkajous, raccooons, ringtail cats and coatimundi. This forum is for our exotic cats. From the smaller bob cat, lynx, caracals and servals to lions, cougars and tigers! Okay monkey lovers! This is the place for you! Come talk to other primate owners about you're fur children! Are you a bird person? If so, come find others to brag about your birds to! I'm sure the exotic bird owners out there will have a blast on this forum. Come and post! Squirrel enthusiast? Check out this forum! You can ask questions and talk about all different kinds of squirrels from our more common reds, greys and flyers to harder to find prevosts and giant asian flyers! Do you have reptiles or amphibians? Come post about them in this forum! Want to talk Chins well this is the place for you! Or if you have a problem and a question we will do our best to help you out!! Got the ferret frenzy? Want to learn about the little jesters? Or maybe you came to show off your carpet shark? This is the ferret board and everything ferret related can be talked about here. Prairie Dogs are the most social members of the Squirrel Family and are closely related to ground squirrels, chipmunks and marmots. There are 5 species of Prairie Dogs (genus Cynomys). Have an interest in an exotic not specifically listed? This section is for you! Bettongs, Civits, Tayras, Springhaas, Australian Possoms, Wallabies, Bears, etc. This is the place for you if you're a hamster, gerbil, mouse, rat, guinea pig or other rodent lover! All about rabbits forum! Come post about your bunnies! Post about your loveable pets here!! Chatter about your livestock here! Other dometic pets not already listed. This is a forum to email the tech admin your photo of your animal(s) to be shown off on the above bar on top of the forum! A Place to tell your experiences with different breeders. Links for different breeders in your area. This is the place to tell the animal community about your experience with a vendor. Please make a single post with the facts about your transaction, good or bad. Discussion will not be allowed. If you have a question about a post, please PM the person who posted. Vendors web addresses are in this thread! Come check them out! Come talk about the rescues (all kinds of animals) you have gotten, or rescues you need to find homes for. If you're a rescuer, or know of a rescue, please leave the web address here so people looking for a wonderful animal with a forever home can find you! Please post what State your favorite vet is located, and all their information here for those looking for a wonderful vet for themselves and their children. This is the place for vendors to post experiences with thier buyers. Place your ads for exotics and supplies in this forum! Post any ads for domestic animals or accessories you have here! This is for people who are looking for good homes for their pets, or for people who can no longer care for their exotics. This is a rescue and rehome forum. Animals "for sale" shouldn't be posted here. Place to post an ad for something you want to trade. Trades only please, does not have to be animal related, but please - no animals. For those things you have that aren't animal related.